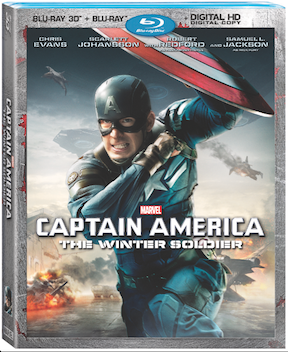 Captain America: The Winter Soldier Coming To Blu-ray 9/9! Based on the ever-popular Marvel comic book series, first published in 1941, Marvel’s Captain America: The Winter Soldier is produced by Kevin Feige, p.g.a., directed by Anthony and Joe Russo, from a screenplay by Christopher Markus & Stephen McFeely, and stars Chris Evans, Scarlett Johansson, Sebastian Stan, Anthony Mackie, Cobie Smulders, Frank Grillo, Emily VanCamp and Hayley Atwell, with Robert Redford as Alexander Pierce and Samuel L. Jackson as Nick Fury. Captain America: The Winter Soldier is presented by Marvel Studios. The executive producers are Louis D’Esposito, Alan Fine, Victoria Alonso, Michael Grillo and Stan Lee. The film set a new record for the all-time biggest April opening weekend with $95 million at the domestic box office upon its release on April 4, 2014. It is distributed by Walt Disney Studios Motion Pictures.